By day, Australia is home to some of the most stunning natural wonders in the world, and by night, they are rivalled by our starry night skies. Observatories and dark sky parks are popping up all over Australia to offer visitors education and events for the ultimate stargazing experience. View the Milky Way through a NASA telescope, along a cultural tour or from the comfort of a luxury outback campsite. Whether you head to the mountains of Tasmania to view the Southern Lights or hop aboard a cruise under a canopy of stars, you can’t go wrong when it comes to Australia’s starry splendour. To make sure you get the best view in the world, we’ve compiled a list of the best places to stargaze across Australia. You’re going to want your camping gear for this one – and a torch. Australia’s first and only dark sky park has banned all light pollution in the area to preserve the beauty of the constellations and the animal populations that roam this outback NSW region. No night pollution means viewing the Milky Way with no obstructions, just like we did hundreds of years ago. By day, feel free to wander the national park in search of emus and kangaroos or visit the forest recovery centre to learn more about the region. But when the sun begins to go down, that’s when this park really shines. We recommend a camp among local bushland for a night-long view of this extraordinary, 100 per cent obstruction-free sky. The moment Neil Armstrong walked on the moon, CSIRO’s Parkes radio telescope was watching from a grassy, sheep-filled paddock in NSW. This 64-metre-wide telescope stands proudly about 370 kilometres west of Sydney and now opens its doors to visitors. Known as the Dish, it’s one of the largest single-dish telescope in the southern hemisphere and has assisted in thousands of scientific discoveries. Just seeing this monster up close is a thrill in itself, and exploring the universe in a high-definition 3D experience even more so. Kids will relish the telescope’s sheer size and enjoy completing a scavenger hunt of the night sky. It’s the perfect chance to engage in a little piece of space history. Outback Astronomy Broken Hill may be a 13-hour drive from Sydney, but the significant distance from the city lights makes it the perfect viewing point for stargazers. The experts at the ranch will take you on a guided tour of the sky with their Sky Shows that explain phenomena in space and tell you what to look for when you give it a look for yourself. After your fun-filled education session, head out to the remote bushland for a guided tour to learn about constellations and spot them for yourself from the perfectly dark desert plains. There’s no doubt about Uluru’s incredible scenery, making for the perfect daytime getaway. But just as stunning as the sun-splashed landscape is the extra-terrestrial beauty after dark. Ayers Rock Resort is a must for stargazers for the annual Uluru Astronomy weekend, celebrating its sixth year in 2019. Enjoy astronomical seminars and photography, film screenings at the outdoor cinema and a very special star-lit dinner. This out-of-this-world weekend takes place every September for perfect weather under the stars, though if you can’t wait, head to the Uluru-Kata Tjuta National Park, just 15 kilometres from Ayers Rock Resort for tours, talks and views kilometres high. We love Kakadu for its hikes and waterfall wonders, but perhaps an overlooked NT favourite is the night-time tour of Yellow Water billabong. The Algohgarrng Experience (Yellow Water under the stars) is a beautiful cruise led by an Indigenous guide where nocturnal animals and Dreamtime Aboriginal stories abound. The 90-minute tour will teach you about the sky’s spiritual and cultural connections with the landscapes while you float through starry reflections in the beautiful waterway. You may even meet eyes with a crocodile going for a float himself. No tents? No problem. Luxury camping at Arkaba Conservancy means perfectly dry weather and unobstructed views of the Milky Way. Arkaba’s almost 25,000 hectares of conserved bushland offers endless opportunities for helicopter rides, safaris and animal spotting, but it’s the night-time offering that really stands out. With the vast bushland excluded from light pollution, you can view the night sky like it was intended – completely clear and bright – and not to mention, from the comfort of a specially constructed raised timber deck, between crisp cotton sheets in the heart of the Flinders Ranges. Just 35 kilometres east of Perth awaits the heritage-listed Perth Observatory where a team of astronomy buffs will teach you everything you need to know about spotting constellations and the history of the night sky. Their extensive list of tour options means there’s something for everyone, with bus tours, Doctor Who-themed tours and New Year’s Eve tours among the most popular. Passionate tour guides will give you a glimpse into historic and modern telescopes as well as into the world of space science. You may be surprised to find that this Australian landmark, famous for its daytime tours through colourful granite cliffs, truly comes to life at night. On a dark night you’ll be amazed at the wondrous sky that fans out around you. The area is known for limitless views which makes for unobstructed sky. 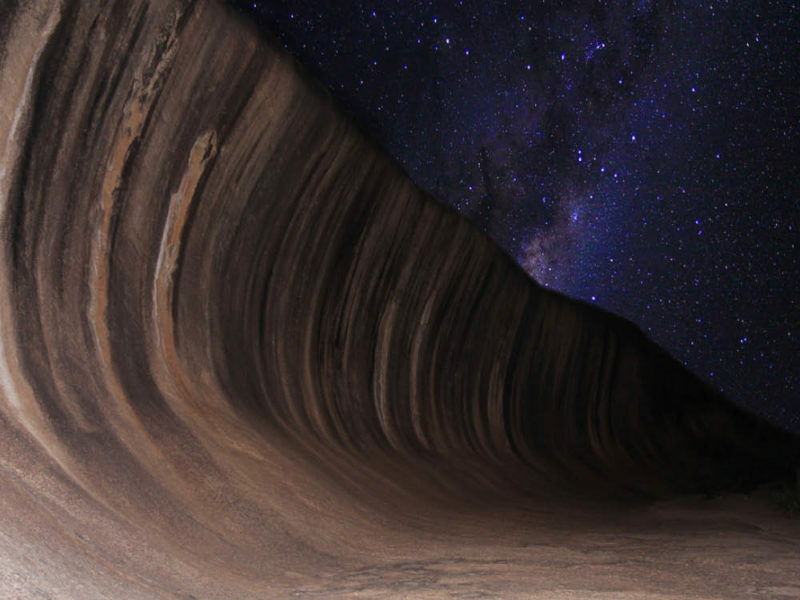 This may be a bit of a trek from Perth’s city centre, but the remoteness of Wave Rock makes for the clearest of night skies, away from any pollution. A stargazing lounge is even in construction, planned for completion soon. 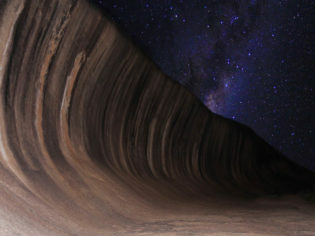 So get ready for a luxurious and relaxing stargazing experience at one of Australia’s most beloved monuments. It’s no secret that Tasmania is the best place to view the stunning Aurora Australis, or Southern Lights, as they make their appearance year round. Though it’s important to be mindful of anything that may come in the way between you and this colourful light spectacular – mountains, buildings, trees and light pollution. You may be able to experience the phenomenon from all over Tasmania, but we recommend a trek up Mount Wellington in the heart of Hobart for those unobstructed views. Remember to wait for a dark, clear night, preferably winter when the lights can last until as late as 10pm. The higher you climb, the more beautiful your view will be, so ascend high up the beautiful hillside to your awaiting front row seat. For other viewing spots, follow the Tasmania Astronomical Society calendar for meet-ups all around this miraculous island. Who says it has to be dark to explore the constellations? The Cosmos Centre in Charleville holds its iconic Astronomy by Day events where visitors can hold meteorites, experience space travel in the Cosmos Theatre and look at the sun through a filtered telescope. Get to know the wonders of the sun and see it up close at this extraordinary star-gazing experience – the sun is just a big star after all. If you get the chance to stay after dark, have a look through the telescopes in the observatory and learn something new from an Aboriginal night-time story session. The historic old Melbourne Observatory has resided in the Royal Botanic Gardens Victoria since 1862 and continues to delight visitors with astronomical tours and roof-top stargazing adventures. The Starry Southern Skies program, put on by the observatory, gives a glimpse into the movements of the Moon, stars and distant planets, while guides can take you to the roof for a further look around a rotating room that opens up onto the Australian night sky on all sides. The Melbourne Observatory is one not to miss, but if you’d like to take your astral knowledge further, head over to the Melbourne Planetarium for an interactive and digital starry-sky experience. If you’re making your way along the Great Ocean Road, you’ll see some amazing natural wonders, but let us be clear that stargazing is an absolute must. Visit the Alkina Lodge where the vast skies of rural Victoria strike all of those who view it. These quaint lodges are nestled among 40 hectares of Australian bush and make for the perfect spot for clear views of the Milky Way. Grab a blanket and a hot chocolate and take in the boundless views from the lodge’s telescopes and lounges on the back patio.